Happy New Year! I pray that this year brings you lots: lots of time with our Father, lots of happiness, lots of health and lots of success! To help you with all of that, I’m sharing two free printables created just for you! 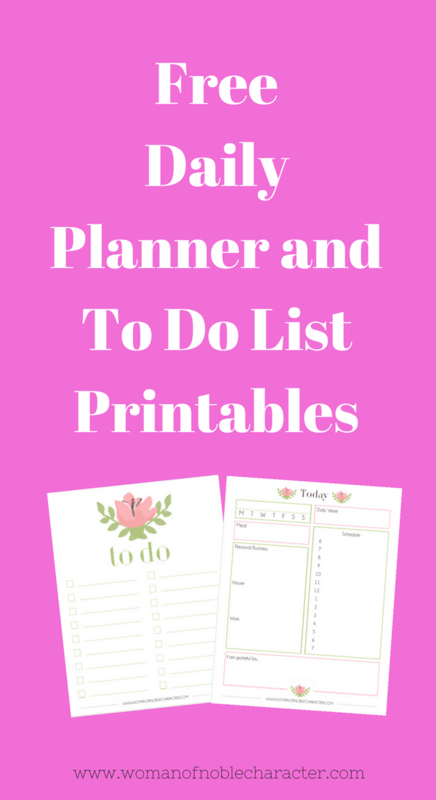 Free planner and to-do list printables. Print them out (I print 4-5 at a time) and keep them on my desk to keep track of what I need to do each day for work, my website and at home. The planner also includes a space for you to write a verse to fuel your day and a place for you to write what you are grateful for each day. Having His Word on something you will refer to often throughout the day will keep Him at the forefront of your mind and heart. Writing what you are thankful for each day reminds you to be thankful in all circumstances. Even the difficult times when you are struggling to find something to be grateful for. The planner also has a place for you to jot down what’s for dinner that night (perhaps to remind you to take something out of the freezer!) 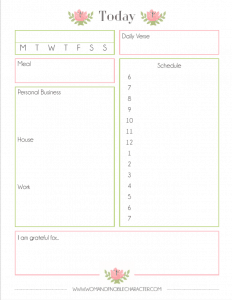 For weekly meal planning, you can use the weekly meal planning printable found HERE. 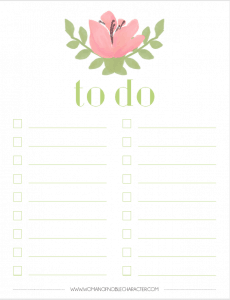 The to do list will help you keep track of the many things that as wives and mothers we have to do on a daily basis. Both printables will help you manage your busy days and weeks and keep your focus on the Sovereign King! To download and print, simply click on the photos below to get to the download page. No email needed! As I’m always looking for ways to better manage my time, I’m super excited to have found the Ultimate Productivity Bundle and have already used many of the resources in it. I am particularly excited about the Beyond Blessed Life Planner for Christian Women by Ana Willis and the Driven Women Grace Based Productivity for Christians by Phylicia Masonheimer. Both the planner and the course are chock-full of resources specific using the time that God blessed you with wisely. I’m also loving the Life Management Binder. With colorful printables, helpful charts and checklists, you have everything you need to manage your home, your family and your life. You can grab all of the above resources (just the three mentioned above are valued at $139!) for $37 but you also get tons more! Courses, a summit and hundreds of printables. Just use what appeals to you. It’s an amazing value. You can grab yours here. 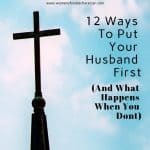 There really is no better resource for time management for Christian women! What other free printables would you like to see in the coming weeks and months? Tell me below!